The Smith H2051B-580 flowmeter/regulator features exceptional value and compact design. It provides precise shielding gas regulation for MIG and TIG welding applications. Shatter resistant polycarbonate flow tube features triple scale for Argon, Helium and Argon/CO2 and has a packless O-ring flow tube seal, which reduces maintenance. Built-in rupture disc reduces possibility of flow tube damage due to high pressure inlet surge. Precision flow adjustment valve locks flow at desired setting. Can the Smith Flowmeter Regulator - H2051B-580 be used with nitrogen? what type of gas line does this regulator take, and well it accept a bar fitting? The Smith Flowmeter Regulator - H2051 would fit your need and is probably the easiest way to go. Does one read the top, middle or bottom of the flow indicator? I bought an inverter welder and the regulator that came with it didn't work right out of the box and rather try to return it, I decided to go with a name that I know. Works great and you can't beat cyberwelds prices. After checking the Cyberweld site, we discovered we could buy a brand new complete flow meter for less than half the cost of parts to rebuild the identical Smith unit we had. This was a no brainer, delivery was prompt and we are back tig welding again. Thanks Cyberweld! ProsA new flow meter quickly. Pleased with this product, fit and functionality are great. Attached it to the welder and it works. Works great right out of the box, fast shipping. 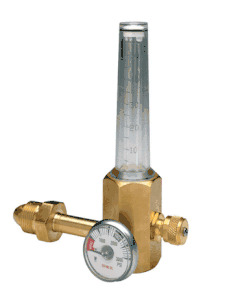 Tremendous deal for a dedicated flow regulator, very easy and precise adjustments. Product is nice works flawlessly, however pipe thread WAY tight, had to retap in order to get anything to fit in. Prosgood quality, good operation, smooth this is nice! Consthreads too tight, would be nice if it came with a hose barb installed, numbers on flow meter a little hard to read.